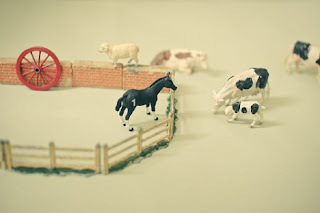 Cassia Beck has one of the loveliest blogs that I have seen. I'm a little late blogging about this one (story of my life it seems! ), but you should check out Cassia's second year-long project called Horse. The subject is a toy horse she used to play with as a child. The goal is to photograph this horse every day for a year by creating a different scene every day. The end result is to make the collection into a book next year. You can check out her flickr images here or you can check out her blog entitled Horse.